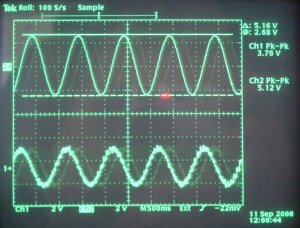 Depending on the digitiser type, sine-wave, step and broadband noise signal generators may be available. 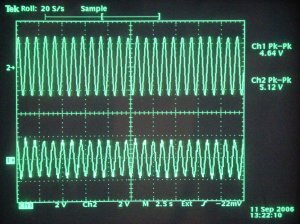 In this article, we will use a sinusoidal input signal to determine the sensor response at a single frequency of interest. Calibration with a DM24 and Scream! 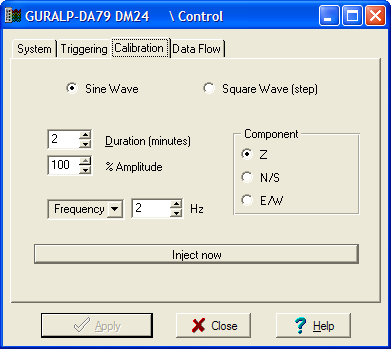 Select the calibration channel corresponding to the instrument, and choose Sine wave. Select a suitable frequency, make any other choices you require, and click Inject now. A new data stream, ending Cn (n = 0 – 7) or MB, should appear in Scream!’s main window containing the returned calibration signal. Click on Ampl Cursors in the top right hand corner of the window. A white square will appear inside the Waveview at the top left. This is in fact two superimposed cursors. 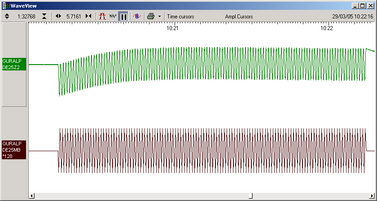 Drag one cursor down to be level with the lowest point of the signal trace. Drag the other down to be level with the highest point. The Ampl Cursors button will now be displaying a value, which is the strength of the returning signal in counts. Measure the other two signal strengths in this manner.If you have used the Scale… option, you will need to take the scale factor into account to produce the correct number of counts. Convert the returning signal to volts using the µV/Bit value given on the digitiser’s calibration sheet for the sensor input port. 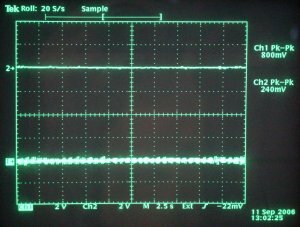 Measure the input calibration signal, and convert it to volts in the same way.A DM24-series digitiser should generate a calibration signal of around 16000 counts, or 4 V, when set to 100%. At 50%, it will produce a signal around 10000 counts, or 2.5 V.
A resistor is installed within the calibration loop, whose value is given on the sensor calibration sheet. The input voltage you measured in the last step is effectively the voltage across this resistor, allowing you to calculate the current flowing through the calibration coil. The calibration resistor is placed in series with the transducer. Depending on the calibration signal source, and the sensitivity of your recording equipment, you may need to increase R by adding further resistors to the circuit. a = I / K = V / RK . This voltage is the equivalent input velocity. R and K are given on the calibration sheet. Divide the voltage of the returning signal (measured in step 9) by the equivalent input velocity, to obtain the velocity sensitivity at the frequency of the calibration signal. The measured sensitivity for a 1 Hz calibration signal is given on the sensor’s calibration sheet. Since the instrument has a flat velocity response over the passband, measurements at other frequencies should give the same result. Calibrate any other sensors connected to the digitiser in the same way. You must wait for the previous calibration to finish before doing this: clicking Inject now has no effect whilst the Calibration enable relay is open. You can inject your own signals into the calibration loop either directly on the sensor connector, or through the banana plugs on a Handheld Control Unit (HCU). Connect the HCU to the sensor using either of its 26-way connectors. Power the sensor through the 10-way connector on the HCU.The meter at the top of the unit allows you to monitor the voltage outputs of the instrument. To change the range of the meter between 1 V and 10 V, use the nearby RANGE switch. The knob marked with MASS POS and VEL allows you to select which velocity component or mass position is being monitored. Connect a signal generator across the CAL SIG banana plugs, and configure it to output the desired signal.A sinusoidal signal with an amplitude around 5 V is recommended. If you are using a 3T sensor, or another sensor with individual calibration, turn the CAL ENABLE knob to V, N/S or E/W according to the component you want to calibrate.If you are using a 40T, or another sensor with combined calibration, turn the CAL ENABLE knob to V.
Connect an oscilloscope or other monitoring equipment across the blue VELOCITY – and + banana plugs for the component you are calibrating.If necessary, connect a second channel across the CAL SIG banana plugs, so that you can measure the input signal. Tap the ground surface near the sensor to check that the output signal reflects local vibration. Whilst the sensor is being calibrated, it will still respond to ground motion. To make accurate calibration measurements, you should make sure external vibration is minimized. 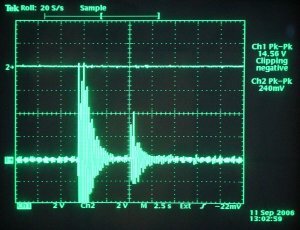 Measure the peak-to-peak amplitude of the calibration signal and of the output signal from the sensor. Derive the equivalent input velocity from the input signal voltage, together with data from the calibration sheet, using the formula: v = V / 2 π f R K as described above. Divide the voltage of the returning signal by the equivalent input velocity, to obtain the velocity sensitivity at the frequency of the calibration signal.